Saint Vincent and the Grenadines declared its independence from the United Kingdom on October 27, 1979. Since then the nation annually celebrates its Independence Day, that is a national holiday in the country. Saint Vincent and the Grenadines became the British colony in 1763 and it passed through different stages of colonial status. On October 27, 1969 Saint Vincent was granted the status of associate state. This status gave the country full control over its internal affairs, at the same time it was short of full independence. 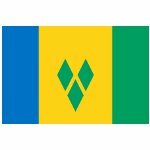 Saint Vincent was granted full independence on October 27, 1979, becoming the last of the Windward Islands to gain independence. Annually various events are organized to celebrate this holiday. The festive events may start several days before and culminate on Independence Day. All people enjoy free cultural exhibitions, fairs, food sale and attend church service. People often wear national colors on Independence Day to show their national pride.